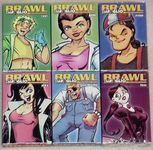 A whole display box of Brawl. Three of each Club Foglio character deck, plus the lovely display box that they come in. Why would you need three of each character? We don't know. Share with your friends. Give them out as party favours, or as halloween treats. Six characters—three of each—eighteen decks altogether. Have a party!